Map of St. Ouen broken into 4 quadrants. Map/Suitcase Preparation. 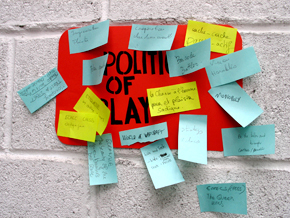 Politics within Play brainstorm. 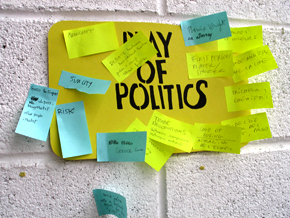 Play within Politics Brainstorm. 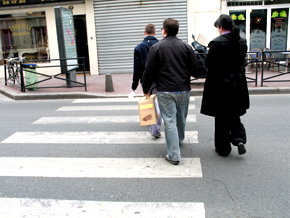 With thematic suitcases, four groups disperse into the city for one hour. Here a team is interviewing a group of school kids about the rules they have. Collecting votes from people on locally related issues. “No Posters allowed here since 7.29.1887"
This game was inspired by a small, pedestrian friendly intersection. 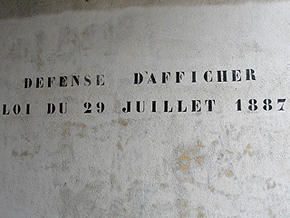 This particular area of St. Ouen is a popular place for graffiti and political stencils. 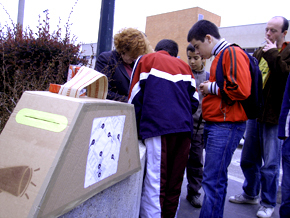 The idea for the game was to get people in the neighborhood to collaborate, meet and generate a critical view of one particulare aspect of the neighborhood/community. 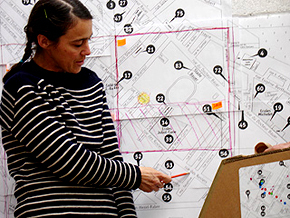 For this particular workshop, Neighborhood Graffiti Award was created as such a platform. 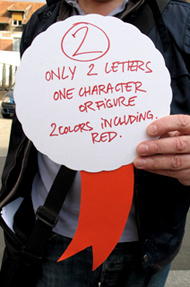 -Teams go out with prize ribbons and have 20 minutes to find the graffiti with matching criteria. 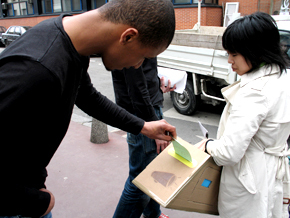 -Each team must document the graffiti to prove that it matches the winning criteria. -Each team must present their photos to the judge to prove that they meet the criteria. -To the neighborhood becoming a cultural territory defined by the community. -A finish line is constructed and the first team to finish must cross the finish line as a sort of ceremony. -Graffiti or street art (this game could be applied to many things; planter boxes, front doors, houses etc. anything that people could vote on aesthetically or in terms of craft. 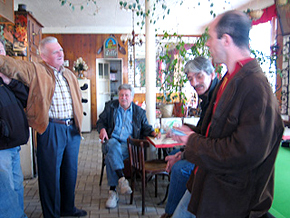 The residents would define the criteria for the game and prizes. What are the political aspects of the game? Flipping reality: Graffiti is looked at as ugly, illegal, garbage, but this game quantifies it into distinguishable elements: color, characters, placement giving it new meaning and value in the medium of game. What was the motivation to make this particular game in this particular place? -The amount of graffiti in the area. In a calm area. This area is very quiet from Tuesday-Friday because the flea markets are closed so this activity would cause a reason for people to be out in the streets and involved in a social activity. 100;s of them just two pieces of paper people can flip open and closed to see two frame animation. Who does the project benefit? The graffiti and to reflect on it or see it in a different light. Who is it for (audience)? What aspect of "community" does it address? How could technology be incorporated in this piece?. So that players know where they stand in the cometition. The game made people look at graffiti in a different way. 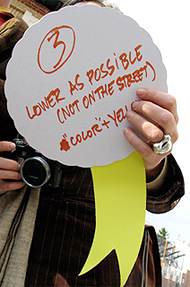 The criteria forced one to look at graffiti in terms of elements; color, form, and placement. Finish Art Project: A wall of post-its. Each post it had two sheets with one drawing on each, forming a 2-frame animation. The animation could be viewed if you quickly opened and closed the top paper from the bottome paper. Very simple and interactive. Many blank post-it's were on the wall for visitors to create their own animations. A game where you scan a bar code and it becomes a character. You can use pre existing Bar Code Battler cards or cut bar codes off cigarettes, gum or whatever to create new characters. 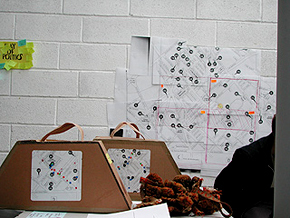 Plot Casting was inspired by interviewing peole about their desires for the neighborhood. Many people wanted more trees and would like to remove urban furniture and replace them with trees or plants. One gardener wanted to do "flower terrorism". 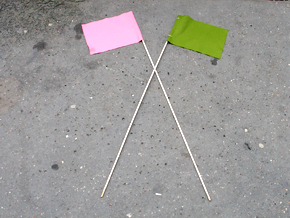 People are divided into two color coded teams (here green and pink). Each team has a bunch of small flags, saying "plant a tree here" or "plant a flower here". Starting from a base field, the team members spread out and try to place their flags as quickly as possible around the area where plants could grow. One flag should be at least 10 meters away from the next and only put where no plants are growing yet. The team wins, who spread all the flags first and returns to the base plot. 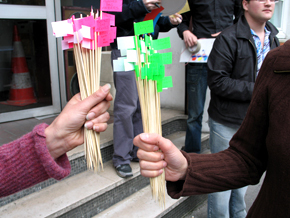 The players are divided into two groups, to distribute the flags in in the neighborhood. The group that has planted all the flags first is the winner. 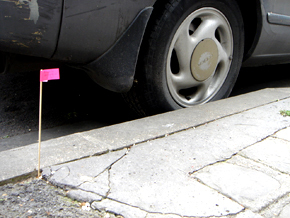 The flags prompt passersby to plant flowers or trees at the indicated spots. 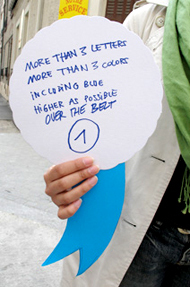 Making the need for green spaces visible, environmental concerns. Teams acting like wind spreading seeds- distributive computing. 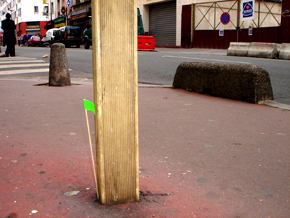 The idea was inspired by a gardener from St. Ouen who wanted to do "flower terrorism". Giving the game a competitive, speed-based character which reminds of aggressive competition in economy to be first and faster than the competitors. Local people (beauty, air quality)and for visitors (it makes it more attractive). Animals. The planted flags communicate to the people, and can bring up a conversation, make the need visible to locals and local politicians. 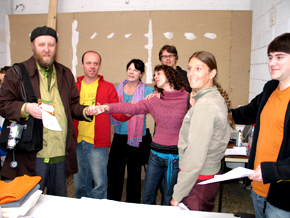 A movement can emerge that makes people plant together, like a demonstration through planting. Take pictures as documentation, map with GPS the places where people want to have green and that could become plots. This map could also be sent to the mayor of St. Ouen. There is really a lack of green spaces in St. Ouen that people would really want to leave the area for that reason. It was also surprising that people were afraid when we started talking to them and asking them questions.